Why is 7UP Called 7UP? 7UP is a lemon-lime soda brand owned by the Dr Pepper Snapple Group. With origins tracing back to the 1920s, it’s the oldest remaining lemon-lime soda brand. Though 7UP is still a visible brand today, it now faces stiff competition. 7UP has implemented many different brand messages throughout the years, but was in its prime during the 70s. Then, it marketed itself as the “Uncola” – the antithesis of Coca-Cola in every way. It was known for being fresh, clean, and clear, with no aftertaste or caffeine to speak of. 7UP was the third best-selling soda brand in 1972, largely due to that campaign. Fast-forward to present day. 7UP now holds less than 1% market share. Fellow lemon-lime sodas Sprite and Mountain Dew are the third and fourth best-selling soda brands. The brand has toyed with so many different messages and slogans that it’s nearly disappeared altogether. 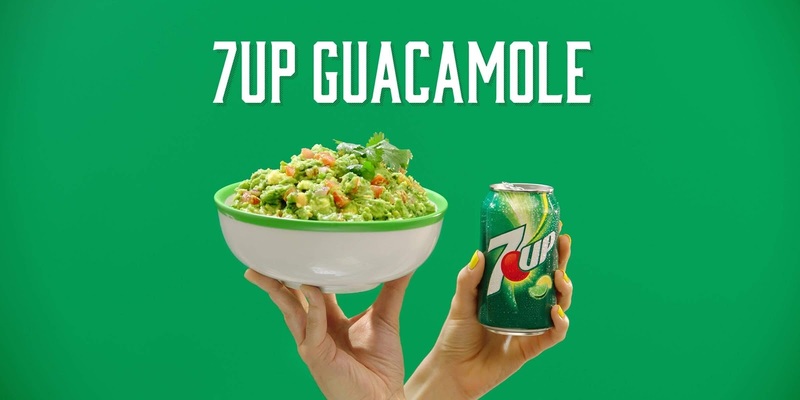 7UP’s latest slogan is “Do More With 7UP.” It emphasizes using 7UP as an ingredient in different recipes. They range from the expected – Shirley Temple, Sherbet Punch – to the very unexpected. I’m particularly intrigued by 7UP Eggnog, 7UP Cinnamon Rolls and 7UP Guacamole. If you try any of those, PLEASE let us know in the comments. Especially if you try the 7UP guacamole. I’m wanna know. Why is it called 7UP? First, we need to answer the question: what exactly is it called? 7-Up? 7 Up? 7up? 7UP? Seven-Up? Seven Up? While researching this article, I saw the soda name spelled in literally all of those ways – I’m going with the spelling on the official website, which is 7UP, although Google Trends shows 7 Up being the most popular search query over the last year in the United States. Now, how did 7UP get its name? People seem to be even more confused about the origin of its name than they do about its spelling. 7UP was invented in October 1929 by Charles Leiper Grigg. Grigg had already developed an orange soda called Howdy. Howdy was fairly successful, but failed to seriously challenge market-leader Orange Crush. Grigg set out to produce another soda to broaden his customer base and created the lemon-lime soda now known as 7UP. Grigg’s soda was first known as “Bib-Label Lithiated Lemon-Lime Soda.” “Bib-Label” referred to the paper labels Grigg intended on using, while “Lithiated” referred to the lithium in the formula. Lithium was largely presumed to be a healthful chemical at the time, so Grigg chose to emphasize the ingredient in the name. (It’s also a mood-stablizing drug.) The long name was eventually changed to “7UP Lithiated Lemon Soda,” and then just “7UP” in 1936. 7Up was the product of 7 ingredients: sugar, carbonated water, essence of lemon and lime oils, citric acid, sodium citrate, and lithium citrate. The “UP” part of the name referred to the lithium mood lift. Grigg saw cattle branded with a similar mark and drew inspiration from it. Grigg thought of it while rooting for sevens during a game of craps. Without Charles Grigg around to confirm either way, how 7UP got its name is still a mystery. Which theory seems most plausible to you? I’m partial to the theory about the ingredients! Comment below.